After fishing 22 days in June with clients catching 940 Stripers [averaging over 40 Stripers per morning] it is finally time for me to take a short break. 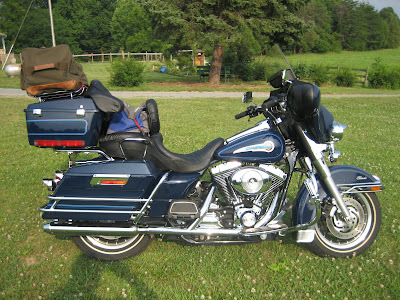 I am taking off July 10th through July 19th and riding through some of the most beautiful areas of the country. We are starting off in Jackson Hole WY. riding through Yellowstone Park up to Glacier National park. Our travels will take us through MT. and ID. and back to Wy., all on mountain scenic highways. My wife Jeanne will be taking reservations for fishing while I am gone. She will also be answering my email's for me. Although I am booked through July John still has numerous openings this month to accommodate your needs. See you back on the water on the 20th of this month. I am so happy for you Daddy to take a break! have so much fun and wear your helmet Paw! Love You!!!!!! !